As grand a day as the Grand Final Saturday is of an International Cup – perhaps the greatest day is the final Friday. Not only are many of the best matches of the tournament to be witnessed but with the tournament coming to an end on the field each of the sides savours the contest and camaraderie all the more. And when the final siren sounds for each side the focus shifts. Around Royal Park on the sun drenched Friday afternoon there was to be seen a thriving barter trade in footy guernseys. Eventually the crowds traipse off – the players in particular prepare for the evenings event – the traditional International Cup Gala dinner. The dinner now held at the Palladium Room at the Crown (Casino) Entertainment complex has been described by The Age senior writer Martin Flanagan (the 2011 dinner) as one of the best footy functions he’d ever attended. And he was back for the 2014 event and like he – those of us lucky enough to attend feel privileged to do so. It’s still somewhat of a secret in Melbourne – the International Cup itself ; we’ve all experienced having to explain to other Melbournians – many AFL fans – that it’s not a soccer event. It’s footy. It’s frustrating. However – when we attend the Gala Dinner and sit two tables from Mike Fitzpatrick and Sam Mostyn; and sit a bare metre or two from Dipper and Sheeds – there’s a surreal element to this that makes a humble Worldfootynews scribe feel very fortunate to be here; saddened that the event is not more broadly known; and in a selfish part of one’s soul partially pleased that it’s not so that we can share this secretive sub culture of Australian Football that many in the AFL either choose to ignore or simply know not of. 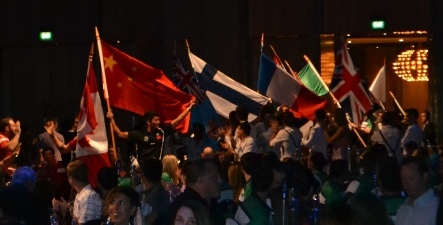 MC James Sherry sets the scene and an early highlight is the welcome of the team captains from the back of the room – they march proudly baring their flags up the centre of the room and onto the main stage where they (the flags) are placed as a permanent backdrop for the evening. This clearly marks this AFL function from the rest – when else can the AFL validly adorn a room with the flags of 18 other nations. The attendant crowd is welcomed by AFL Commission Chairman and Carlton Premiership Captain Mike Fitzpatrick – immediately the difference between the more formal functions and this event becomes clear. This is a night of celebration – true enough – however it’s not austere celebration at the International Cup - that’s not what this tournament is about. Cheers are raised from the room at the mention of debutant teams – Pakistan in particular ever since the roar every time Dipper mentioned them at Federation Square nearly 2 weeks before at the public launch. The same roar moves around the room from cluster of tables to cluster of tables as the video vignettes are played recalling the Fed square launch (I spotted my family down the front – we got there early) and the tournament. Mike Fitzpatrick is joined on stage by Gillon McLachlan (whose brother Hamish MC’d this event 3 years earlier), along with the Tongan players – this year members of both the men’s and women’s teams – and the entertainment of the room by the room begins in earnest. Footballers first or church choir first – matters not – they are amazing, for me it brings back memories of being ushered into the change rooms at Blacktown on day 1 of the 2011 cup and hearing the boys singing a hymn in those confines that sent shivers down my spine (clichéd turn of phrase I know but events like that make you realise the original truism of a cliché). Tonight the song ends and the girls step back as the boys – young men – take centre stage and perform the Sipi Tau (Tongan war dance). That morning the girls – young ladies of the Tonga Thunder – performed it before their match against the Fiji Vonu side. A few hours later the Canadian men faced the Tonga Storm doing likewise (and around crowded the players from the US Revolution and French Les Coqs among others to see it). The Storm actually performed it one more time to their support group after their Friday afternoon loss to Canada. Winning wasn’t the point. It’s all about being here. This is what this tournament is about. Formalities as far as they go are next – player of the tournament for the Men’s is Irelands Mick Finn. He’s been here before. He won the same award in 2008. 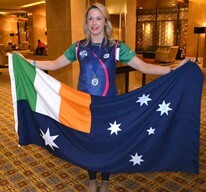 The Women’s award was shared – two extremely fine players who would face off the next day at Punt Road but for tonight Irelands Laura Corrigan (2011 Full Back world team) and Canadian Northern Lights captain Aimee Legault (2011 ruck rover) share the spoils. In between there are 3 courses of food to be enjoyed – sate the appetite – but that’s not the focus. There’s a room to be worked. For me this time around I’ve put in greater effort to get to know some of the players and try to share their personalities, and their stories. There are more to be learned and there are acquaintances – almost friends – to farewell. For Troy Thompson and myself there are particular players to track down – see Troy’s story. Meeting Canada’s Neil Casey and hearing a fine Irish accent immediately highlights another backstory – but, almost everybody here has a backstory. So many are ‘accidental footballers’. Some of those have now become ‘Accidental Australians’ – football migrants. One of those I’ve met who has been super embracing of this tournament since 2005 is Great Britain’s Luke Matias. Four tournaments on he lives and works in Australia and married last year – so much is predicated to the mate who kicked a footy to him. The segue here is to the World Teams both mens and womens. Dipper is on hand taking the main stage to congratulate those selected. The honour and pride is clear, both by those selected and by their teammates who roar approval – drowning out the announcements of the next. The announcement of the Women’s team is followed by Kevin Sheedy taking the podium. Sheedy has long advocated the international game and its development. His suggestion that with 18 mens teams that he’d love to see 1 representative of each side be incorporated into the 18 AFL teams for next year’s NAB Cup – not likely to happen – but a fine romantic notion. Or just perhaps the idea might find its way back to the Commission table. The Men’s team is next and Luke Matias is selected on a half forward flank – he plays “Amo’s” with Caulfield Grammarians in Premier B grade. He’s indicated that he’s not played footy like that he’s experienced against Nauru, and to a slightly lesser extent the fast developing Fiji. Luke loves this tournament and all that it offers. And his pride in being selected in this side is hard to contain – so why contain it? Even greater is his delight when joined on stage by young gun 20 year old uni student Sam Willat who impressed many with his presence up forward for the Brits. The World Team is quality and those who know realise that there’s a pretty damn good ‘B’ team that could be put together too. Names such as Guvari, Beno, Agita, Harris, Trigg, Wolgramm, Nakamura, Oppenheimer, Oura, Sakaki, the flying Valesu, Patacq, Rattenbury, Nash, Kolwinski, Dragus, or “H” Haseeb Qureshi for Pakistan – to name a few – would contribute very nicely in a combined world side. The depth of quality players who are part of this tournament bodes well for those who may be future or present captains, coaches and perhaps footy dads (and mums for that matter) in far flung lands. 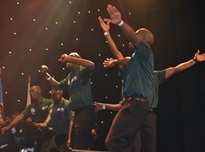 As the night drew later the lads from South Africa performed and a little later bare chested Kiwis – nay – Hawks took to the stage and performed the Haka. Ah that my New Zealand wife might have been here to see it – well, perhaps best not. Around the room though was the mixing – yes, there’s a grand final or two to be played the next day and after that for many a flight or two home. 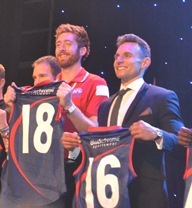 The International Cup gala dinner truly is a footy night like no other – it can’t be on the annual calendar but once every 3 years it’s footy’s little secret that all too many just don’t realise what they’re missing out on. Like a lot in life however – the more you put in the more you get out – and don’t doubt for a minute that the players attending have put in a lot to make their way to our shores for 2 weeks at great expense to display a passion for the game that many AFL fans might struggle to comprehend. I just wanted to publically say I thought this was one of the best articles I've read on worldfootynews.com in our 10+ year history. It certainly is a special night and you captured it really well. Good stuff. seconded - very entertaining article!! Another cracking article, and thank you so much for the inclusion. WFN's coverage of this tournament has really gone to new levels, and I really don't think you understand how much your site and stories are appreciated from all corners of the globe. Well done, and please keep up the terrific work! !